Synopsis: While other teenage girls daydream about boys, Calla Tor imagines ripping out her enemies's throats. And she wouldn't have it any other way. Calla was born a warrior and on her eighteenth-birthday she'll become the alpha female of the next generation of Guardian wolves. But Calla's predestined path veers off course the moment she saves the life of a wayward hiker, a boy her own age. This human boy's secret will turn the young pack's world upside down and forever alter the outcome of the centuries-old Witches' War that surrounds them all. Thoughts: Wow, just wow. This is probably one of the best books I've read all year. It has everything that gets my mojo running: Werewolves, a strong female alpha, forbidden love, lies/deceit and not one, but TWO swoon-worthy males. Calla Tor has always known who she is and who she will be. On her 18th birthday, she will marry Ren and unite both their packs. Her life and the lives of her fellow pack members depend on it. As a Guardian, the pack's role is to obey the Keepers and protect their land. When Calla mysterious saves a hiker from a bear attack, she ends up reveiling her true nature. She has broken one of the forbidden rules. Needless to say, it came as a huge shocker when this boy, Shay, ends up being the new student at Mountain High School. Shay instantly recognizes Calla. They're attraction is undeniable. The harder Calla tries to avoid Shay, the more she's drawn to him. She knows her future lies with Ren, but finds herself lost in Shay's world. 1. Shay is somehow important to the Keepers and they must figure out why. 2. The Keepers may have been telling lies and keeping secrets of their own. Now, I don't want to go to any further in details because I don't want to spoil anything for you. The story is intense. It takes you from one adventure to the next. And I LOOOVE how the chapters are broken down. Once you read it, you'll know what I mean. My advice? Before you read it, make sure you have plenty of time to enjoy it. Once you start, it'll be practically impossible to place it down. One thing I love about werewolves is their pack loyalty. You'll see that, especially in Ansel and Bryn. Both of them, and even Calla herself, would gladly sacrifice him or her self in order to protect the other. The same goes for Ren's pack. You can see how much they respect and obey their alpha. Once you go pack, you'll never go back! 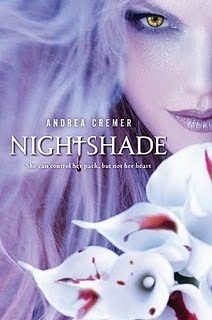 Nightshade isn't due to release till October 19th. What I recommend doing is preordering it. If you can't, make sure to run out to the bookstore when it's out. Trust me, you'll want to read this immediately. Lots of things will disappoint you from time to time, but Nightshade won't be one of those things! On I side note, I absolutely LOVE the cover. It's gorgeous and perfect! Awesome review! Dang it! I don't want to wait until october to read it. You make is sound fantastic but I guess I should try to put this book off for as long as possible since I'll probably be impatient to read the sequel. Looking forward to checking this out eventually! I'm super busy this morning, so I was planning on just reading a few blogs and not commenting, but then I read this review, and I just had to saw WOW! Awesome! My desire to read this before your review was non existant, but now I MUST read it! Thanks! WOW just WOW...i cant wait to read this one even more now! EAK soo awesome! It's SOOOO good, you guys. I was sad when I had to send it off to the next reader. I wish I could've kept it and sent it to y'all. Wow! Awesome review. I am now even more excited to read this book. It sounds amazing.